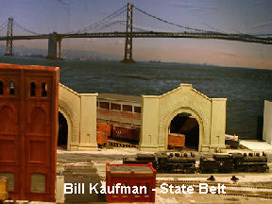 The State Belt ran for a hundred years along the piers and into the warehouses of the San Francisco waterfront. Bill has taken important elements like the car float, the interchange at King St. (where the sometime World Champion San Francisco Giants play today), the street running, and the switching areas under Telegraph Hill and built them into a 12' by 12' layout using some interesting modular techniques.. The operations themselves follow the pattern of the actual State Belt with two crews each working its own division. The railroad was and is controlled by switch lists. The prototype never handled way bills or any other official documents. Each of the connecting railroads sent a switch list with its cars and the railroad charged them for each movement, irrespective of contents or distance. 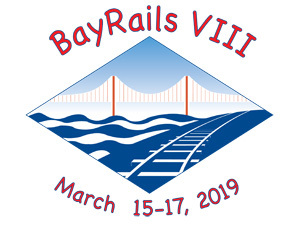 We use a "Chief Clerk" who, using a standard car card and waybill system, simulates the ATSF, SP, WP and Northwestern Pacific railroads car forwarding system and writes the switch lists. The "staging" on the layout consists of three carfloats and three cassettes that attach temporarily to the end of various streets. The railroad itself is built and totally functional. Basic buildings and scenery are in place. About 125 cars are switched each session with a motive power department of two sound equipped 0-6-0s and four Alco S-2s with LokSound chips. The locomotive control system is Lenz with CVP wireless throttles. All switches are hand thrown because that was the way it was on the State Belt.